Organisers are pleased to be hosting guests from near and far and it’s time to welcome them to Hotel Groovin 2019. The GTM 2019 line up has something for everyone - from new favourites like Jack River and Haiku Hands to flat out legends and GTM alumni Hilltop Hoods, Hermitude and Regurgitator. 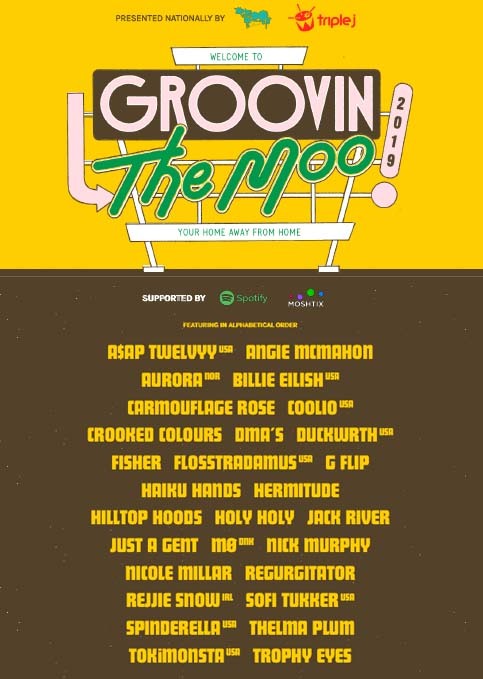 The triple j Hottest 100 was packed to the rafters with GTM artists including Billie Eilish (#8 When The Party’s Over, #17 Lovely, #46 You Should See Me In A Crown) G Flip (#38 About You, #62 Killing My Time) and Angie McMahon (#49 Missing Me) with Thelma Plum, Hilltop Hoods, DMA’S and Trophy Eyes taking out numerous spots on the countdown.